Solid little 75 going down on BaT. Love those seats! I'm interested to see where it will land. My guess is low 30's, but that will be a very good buy imho. very cool car, I'm going to guess high 30's on it. That being said BAT has cooled some. Well the entire market has cooled. Maybe with March here a spring fever will spark things?? My guess is in the 40s/50s. Find another early 74/75 midyear coupe Time Capsule with 50k miles or under that is mechanically perfect, all paperwork since new, and original paint that's in remarkable shape. 95% of the midyears advertised online are junk- all modified, repainted, hotroded out, or driven to the ground. This here is a rare original specimen and I think collectors will be hot on this. I like the car very much, but the pool of middie lovers is very small. Many so-called enthusiasts still turn their nose down. Bitter chocolate is a polarizing color, too. I say it gets bid up to, say, 36k, and ends RNM. At $23k right now but I see this going to $45k. It’s a bold guess but we will see what happens in less than 5 hrs. Anything under $45k and it’s RNM. Seller is educated and smart to post the workshop manual pics to show the original exhaust configuration - no doubt there would be myriad BaT smart-a$$es going after this one - not to mention people wondering what the EGR pipe is. As I have said a hundred times before, how many '75s are left in this condition in the entire world? 10? 25? 50? 100? I cannot say, but a few have come out of the woodwork as of late. If you absolutely, positively would like a midyear this could be the ticket. For me I would not pay the big money for it, and would rather have a more pedestrian SC/3.2 (and that's coming from as you know, a '75 owner). It's always a treat to see one. Hilarious to see all these BaT people chiming in begging the buyer not to modify it. Trust me - the person who ends up with this is not going to modify it. The only modifying that would need to be done is to remove the brightwork from the wheel arches and the rockers. Those days are long gone with regards to a midyear this clean. Very cool for sure. Funny to think that ten years ago people would have laughed at paying more than $8K for this. Needs to sit a little higher. 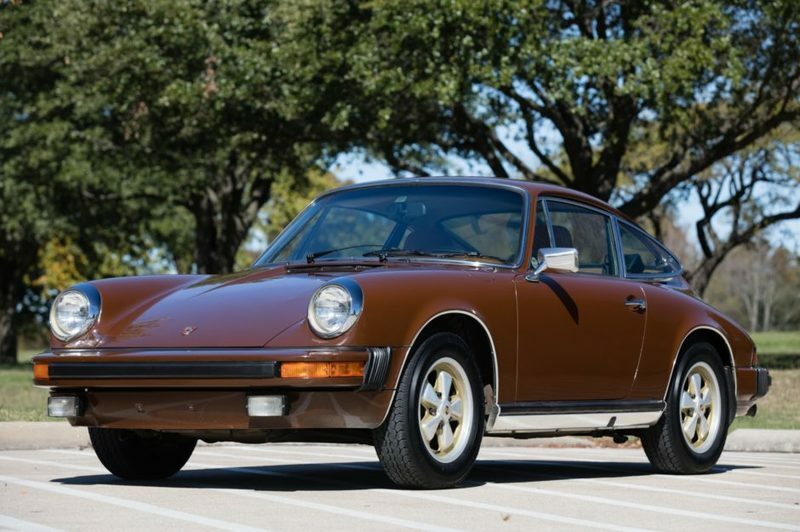 Had to check the vin to make sure this wasn’t my dads 911 when I first saw the listing. He traded it in to a bmw dealer in 1995 with 20k miles on it. Original owner. I hope to track it down if it pops back up for sale. I hereby declare you Grand Master of Middie Pricing. Car was bought well! A true time warp quality car. Glad its staying in Texas and hopefully will see them at some of the PCA events in Texas. And needs a color/diaper change - gross! Plus that bisch looks like it could use about a dozen hamburgers! Last edited by Rawknees'Turbo; 02-28-2019 at 03:34 PM.. Probably will do a serious detail/clay/general cleanup and sell to Europe for $75K. I'm serious. The best cars always change hands without anyone really knowing. There is likely already a buyer lined up for that thing. Contrary to popular belief, the internet doesn't house all knowledge and more important, most buyers of collector cars can really care less about what the almighty internet says. It's a flip car for sure. Buyer is a dealer that has purchased 10 cars this year. , most buyers of collector cars can really care less about what the almighty internet says. That means they care a lot.